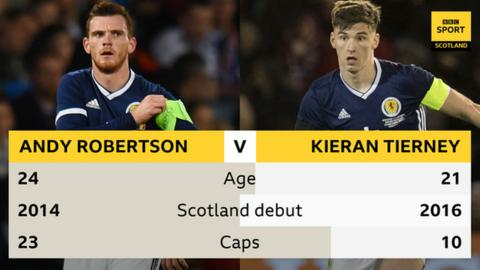 Scotland need to find a system to suit both Andy Robertson and Kieran Tierney, says former manager Gordon Strachan. Despite both being championed as left-backs, neither played their natural position in the 4-0 defeat by Belgium. Alex McLeish deployed captain Robertson at wing-back with Tierney in a back three, and Strachan says such a fix is unavoidable. "You've got two left backs that are top, top class. You can't have one on the bench," Strachan told BBC Scotland. "Alex has to adapt them to a system. People say 4-4-2 is dead but it's not. Look at Uruguay - they play it to get [Edinson] Cavani and [Luis] Suarez up front." During the latter stages of his tenure, Strachan deployed Celtic's Tierney at both right back and centre-back and says the 21-year-old is "more adaptable" than Liverpool's Robertson, 24. "He's brilliant, "he added. "I asked him if he wanted to play right-back and he just said 'yeah'. It wasn't even a conversation. Then he played centre back against England; not a problem to him." Strachan would not be drawn on whether he should have been given more time as Scotland boss after three campaigns in charge ended without qualifying for a major tournament. Scotland drew 2-2 in Slovenia in his final game a charge last October, when a win would have secured a play-off place, and the former Celtic manager laments being "just one goal away". "If Alex can get another goal from somewhere, or defend another goal, we'll be alright," he said. "And you never know where that one goal might have been. "He's changed the group a wee bit, which is understandable because he wants to have a look at some other players. "In Scotland we have to, over the next 10 years, produce three or four top, top players, and then it'll make it a lot easier."